A couple of weeks ago, I was blessed to receive a 32 oz. jar of Tropical Traditions Gold Label Standard Virgin Coconut Oil. What is Gold Label Standard Virgin Coconut Oil you ask? I have used it several times and I'm very impressed. It leaves a very fresh, clean, and slightly coconut-flavoured impression. For me, using the Gold label Standard Virgin Coconut Oil was the best choice I've ever made when frying seafood! Battered Shrimp and Tilapia are two of my favourites and frying in Coconut Oil is so complimentary to them both. Light is IN, folks! I also used the Coconut Oil as a substitute for vegetable oil in baking an Apple-Spice cake this week. It really made a noticeable difference. The cake was lighter, tastier and very moist. Even to the point where my child asked what I'd done differently! So, how is oil made from Coconuts? Ah, just read on and you'll find out! Tropical Traditions makes Coconut Oil using the traditional Filipino method. The method used by Mt. Banahaw Health Products Corp. in the Philippines, whose oil is marketed exclusively by Tropical Traditions as their Gold Label standard, is the traditional fermentation method. "Fermentation" here is defined as the natural separation of the coconut oil from water using gravity. No machine or other substances are used in the extraction. First, coconut milk is expressed from the freshly harvested coconuts by using the pure water that is present inside the coconuts. The coconut milk is then allowed to sit for approximately half a day. During this time, the heavier water separates from the oil by sinking to the bottom, while the lighter coconut solids float to the top (curds). In between the coconut solids and the water is a crystal clear coconut oil that is completely unrefined. The oil is then slightly heated (less than boiling temperatures) for a short time (5 -15 minutes depending on air temperatures) to remove any remaining moisture, and then filtered. The result is a clear coconut oil that retains the distinct scent and taste of coconuts. This is a traditional method of coconut oil extraction that has been used in the Philippines for hundreds, if not thousands of years. 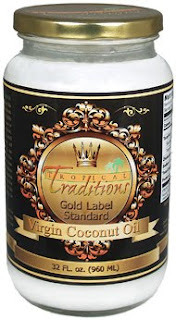 I can highly recommend Tropical Tradition's Gold Label Standard Virgin Coconut Oil! Once you've tried it, you won't be satisfied with anything else. Don't accept imitators, either. This IS the real deal. Be sure to sign up for Tropical Traditions free Newsletter for discounts, updates, and special offers. USER ID 5838650 to receive a FREE copy of their Virgin Coconut Oil Book! Now, how can you top that? Be sure to them that Terri and Liz sent you! DISCLOSURE: We received one free 32. oz jar of Tropical Traditions Gold Label Standard Virgin Coconut Oil for purpose of review. We were under no obligation to review this product. We received no monetary compensation. Our views and opinions are based on personal use and experience.